What size cabinet are you looking for? Check around. There are many of us that have cabinets for sale that do not list them on Ebay or Craigs list. I have a double wood cabinet in VA. Just 30 min. pass Manassas, VA. In good shape. Not great some nicks and other cosmetic things. $1200 you haul it. Again, wood double drawers none for wood type (open) all California style drawers. Sorry, did not see you were looking for storage for wood type. Some people say the drawers can be modified, I have not checked that option out but it is possible. I might be able to take a picture of others, should you be interested. No reasonable offer refused. You would have to make arrangements with me to pick them up. Steve and George offer excellent advice. John Barrett has an enormous selection of Letterpress Things and he is extremely reasonable with his prices. I see him just about every open date and I am never disappointed in his warehouse selection. I’ve been modifying California cases that are in bad shape, I got some that had been chewed on by mice so I just ripped out all the compartments, gave it a light scrub and sand, and polyurethaned the inside- et voila, open cases that fit in my cabinet. I converted an entire 2/3 cabinet to hold small wood type faces and it makes me so happy to see them all organized in one place. Ask your local printers (Chesapeake apha!) If they have any damaged cases… I’m willing to bet they do! I’ve also modified old California cases to hold my wood type. You still have three large compartments per case, so it isn’t ideal for larger fonts, but perfect for the smaller ones. 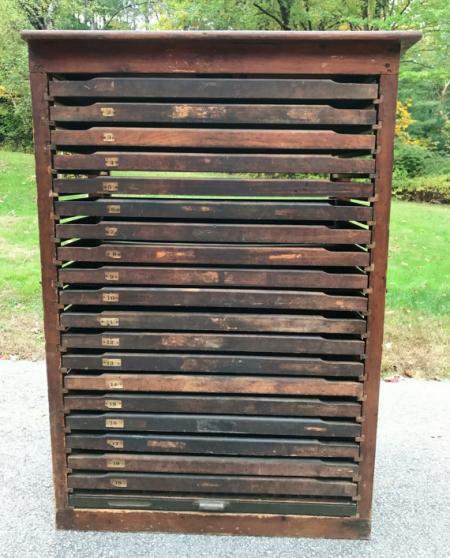 Here’s a suggestion: The people who are selling multiple typecases probably took them out of a cabinet. You might try contacting some of these sellers of typecases to see whether any of them have an empty cabinet to sell. If you are willing to go to Massachusetts, Dave Greer is closer yet. It looks like my wish has come true. Found a cabinet on Etsy with open drawers. Will be delivered next weekend! Thank you everyone for chiming in! Pretty cabinet! Great Etsy score! Have you found a cabinet yet? I have two double slant tops. Let me know if you are interested, thanks, Bill.